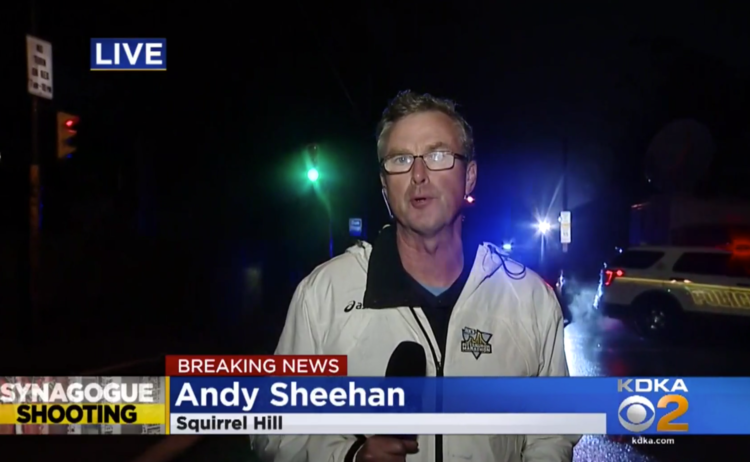 KDKA-TV reporter Andy Sheehan provides a live update from near the scene of the Tree of Life Synagogue shooting which is close to his own home. Neither Sheehan nor any of the other reporters I talked with this week wanted any attention for themselves or for their work. 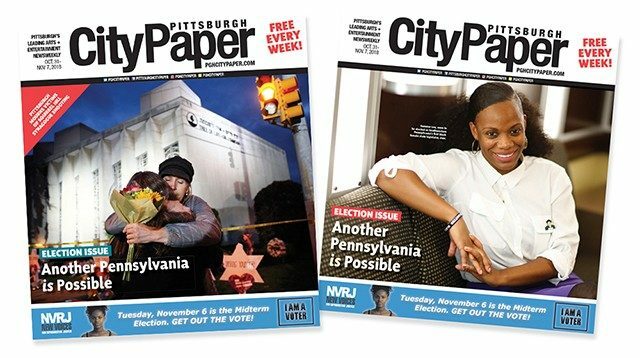 City Paper ran images this week of the cover that appeared (on the left) and the one that had been designed to run before Saturday (on the right). Courtesy of City Paper. Most often, reporters tell of other people’s tragedies and sorrows. This story, of the synagogue shooting and one of the nation’s worst-ever attacks against Jews, touched Pittsburgh journalists in unexpected ways, close to their homes and their personal lives. At least one newsroom in the city hired a grief counselor for employees who wanted to talk about their emotions while covering the story. Justin Matase, the associate publisher at Pittsburgh City Paper, was driving back to his home about 1,000 feet from the synagogue on Saturday morning when he saw police cars racing down the street. He flipped on his phone’s scanner app to find out what was happening, and he also realized no one else had started reporting yet about the attacks. 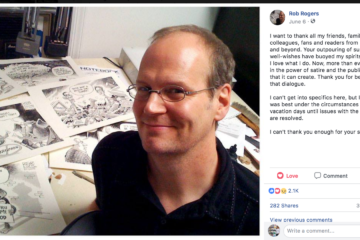 Matase works on the business side of the newspaper but he started reporting out what he learned via Twitter — and then he called senior writer Ryan Deto and gave him details for a story. Within a few minutes, both The New York Times and MSNBC called Matase for information. Deto ended up writing a story based on Matase’s reports and on scanner information. Like many local reporters, Deto ended up commenting for out-of-town news outlets too: He conducted individual interviews with 11 Canadian Broadcasting Corporation radio stations across that country over a four-hour period. Many outlets also ended up ripping up their planned coverage to quickly come up with fresh stories related to the incident. City Paper switched away from an elections cover to a photo of Tree of Life. 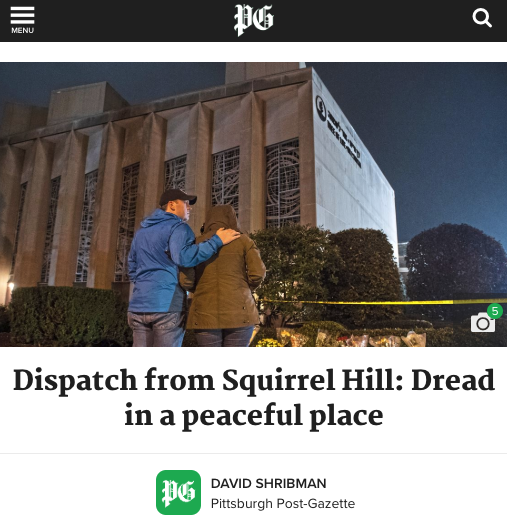 Post-Gazette Executive Editor David Shribman wrote a first-person reflection about how the Tree of Life Synagogue shooting cast a sadness over his Squirrel Hill neighborhood. Pittsburgh Current, which comes out in print every other week, produced online stories about a vigil for the victims and protestors who gathered during President Trump’s visit. Producers for The Confluence, a daily talk show on WESA-FM, came in over the weekend to revamp their shows for this week. NEXTpittsburgh typically sends out a Sunday email with its top stories, but publisher Tracy Certo and editor Melissa Rayworth realized that seemed inappropriate. They instead pulled together new content for a Sunday email with a fresh story about how to talk with kids about the tragedy, a story from Saturday evening’s community vigil and links to national coverage. “I’m guessing many Pittsburgh journalists felt the way we did: I was grateful to be able to do something, anything, and still felt like I wished there was somehow more I could do to help people through this,” Rayworth wrote to me in an email this week. Even though WQED-TV doesn’t cover breaking news, producers at the station realized they could play an important role by quickly creating space for contemplation about what had happened. The production team started reaching out on Saturday night and Sunday morning to potential guests who could provide messages of care and unity, as well as information about resources for parents. The engineers, however, faced an even greater challenge: Filming for the Mr. Rogers movie has been taking place in WQED’s studio, and the crew had removed all of the station’s cameras, sets and furniture. Workers on both sides pulled it all together for a special show that aired Sunday evening. “While this was no small feat, it was our honor to provide a reflection of the unity that was evident across our city in the face of hate,” Darryl Ford Williams, vice president of content for WQED Multimedia, said. David Shribman, the Post-Gazette’s executive editor, lives only three blocks from the synagogue. He wrote a personal reflection about the sadness that descended over his neighborhood. Shribman was able to write about his community with the insights only a resident can bring to a story.